The next time an oil spill occurs, we may be able to leverage new technology to make the clean-up efforts faster and more precise. Scientists with the U.S. Geological Survey have developed a computer model that can track and predict the spread of oil after a spill, which, up until now, has been a very difficult task for first responders. The tool may also be useful in tracking the spread of oil from spills that happened years ago. Oil spills occur when petroleum products are uncontrollably released into the environment, usually by pipelines, drilling rigs or other vehicles and vessels. Since oil and water cannot be mixed, the oil floats on top of the water’s surface. 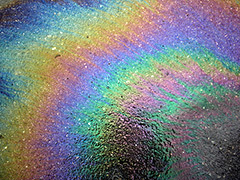 This top layer is called an oil slick, and it spreads across the water’s surface quickly. Eventually, the slick thins and then becomes what is called oil sheen. As time goes on, oil that is not cleaned out of the water takes the form of “surface residual balls,” or “SRBs.” SRBs are conglomerates of sand and oil, and the newly developed computer model is able to track their movements. "The techniques developed here can be applied to evaluate the potential alongshore movement of SRBs in other locations or from any future spill where large quantities of oil and sand mix in the surf zone,” said P. Soupy Dalyander, a research oceanographer. This could make a huge impact in the future. Oil is dangerous to the natural ecosystems it permeates. For one, oil on the water surface blocks the sunlight that some plants and wildlife depend on. Birds and other animals with fur can also be affected if they come into contact with the oil. Because oil ruins the waterproofing and insulating properties of feathers and fur, it can cause hypothermia, which may lead to death. The toxic nature of oil can also poison marine life to death. There are also economic problems that can surface after an oil spill for families and businesses that depend onfishing industry. Posted on February 14th under Pollution Reduction.